House located at the countryside, labelled as a “All mod cons Gîte de France”, beds are made on arrival, I provide bath towels, all the house linen, the washing liquids for the dishwasher and the washing machine, there is a mixed cooker with a oven, a refrigerator, a freezer, a microwave, and a dishwasher. Lounge area with 2 old armchairs, the sofa, and the television. 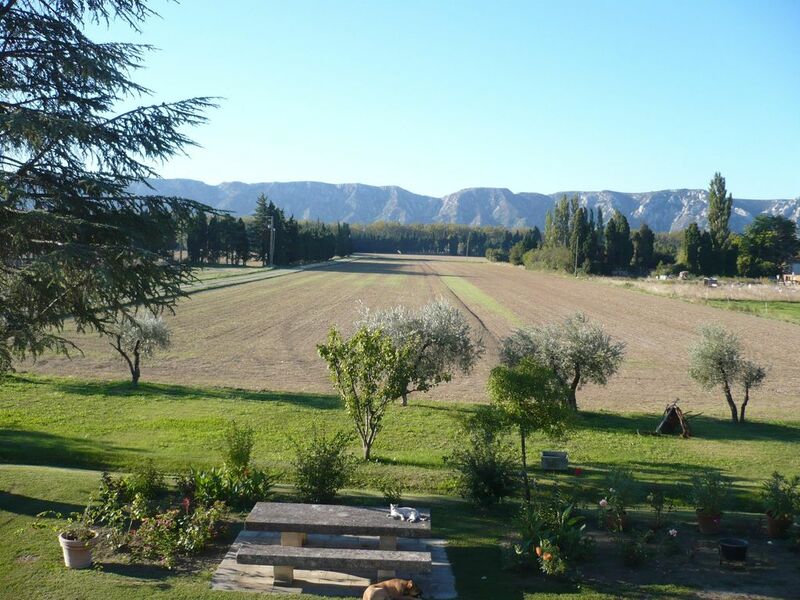 The cottage is decorated with warm colours with a very beautiful view of the Alpilles Range and the Luberon. On site, you can do walks and mountain bike. There is a gliding centre nearby. Very near, there is a swimming pool, tennis, a golf course, the sea, and horse riding. St-Remy is a town loaded with history. Nostradamus, Van Gogh, Gounod, museums, its cloister, the Gallo-Roman site of Glanum but also its shops, its art galleries, its narrow streets, its big market on Wednesdays, and its Provencal events. The bathroom is composed of a shower, a basin, a WC, high and low storage units, a towel rail, household products are provided, bath towels provided to each person, and toilet paper. You will find in the cottage all you need to welcome a baby: travel cot, high chair, playpen, changing mat, bathtub, bottle warmer, pushchair, and cane. For older children, a swing, rings, and a trapeze await them in the large garden. I provide all the household products, the toilet paper, the kitchen paper, and the trash bags. In winter, heating is included in the rental price. I can lend you many things: a cooler, some binoculars, a backpack, all you need to do is ask. My husband and I spent a week in May at this lovely Gite. It was a great central location for exploring the wonderful sites of Provence, and is only 4 or 5 kilometers from the town center. The Wednesday market in St. Remy en Provence was the best market we encountered in Provence. The pictures accurately depict the lovely surroundings, and the hosts (and their friendly dog) could not have been more delightful. We speak some French, and Madame was very patient with us and spoke very slowly so that we could communicate quite well. Very peaceful and lovely, we would stay here again anytime! My wife and I spent 3 days here in late September and had a wonderful time here. We made our reservations at the last minute and the owner couldn't have been more accommodating - she met us at the St. Remy TI and guided us to her beautiful home on a quiet farm a few miles outside of St. Remy. While she speaks little English and I speak just about as much French, we managed to communicate quite well. We learned how to use the laundry and kitchen and got directions to a supermarket. The setting is magnificent and the location is very convenient to Avignon, Pont du Gard, Les Baux (and its nearby Cathédral d'Images, which you should NOT miss). The Queen bed was comfortable, the hot water for showers strong, the living room nicely appointed and the dog friendly. Highly recommended. A welcoming home away from home! We spent a wonderful week in this very lovely gite at the end of September, 2012. As mentioned, it is very clean and well equipped. The setting is very pastoral and nice to return to at the end of a busy day of sightseeing. The owners were lovely and very helpful. While they do not speak alot of English, and we spoke very little (and poor!) French, Madame was very patient answering our questions and explaining things to us. We managed quite nicely to communicate this way. This was our first trip to Provence and the location just outside Saint-Remy-de-Provence, made it a wonderful base from which we were able to easily drive to many varied and wonderful sites in the region (Nimes, Orange, Arles, Mt. Vonteux, Luberon Valley, Marseille, Aix-en-Provence to name a few). On our travels we shopped at the many local markets and looked forward to returning to our gite at the end of the day to cook another fabulous meal, sit on the patio, sip wine and watch the sun go down. We really enjoyed our stay here and look forward to returning again to continue our explorations of this most lovely region! We will highly recommend this gite to our friends traveling to Provence. Je vous remercie d'avoir pris du temps pour rédiger une appréciation trés sympathique. C'est vrai que je parle trés mal l'Anglais mais avec beaucoup de patiente de la part de mes hôtes, on se comprend et c'est cela le principal. J'essaie toujours que mes hôtes puissent visiter notre petit coin de France et apprécier la Provence qui est trés belle et trés riche de part son histoire, ses paysages typiques, ses marchés, ses villages, ses fêtes et bien sûr ses habitants. Pour moi, la propreté du gîte et l'entretien du jardin font partis de l'accueil et de la politesse envers mes hôtes. Chez moi, c'est trés calme avec toujours, cette vue exceptionnelle sur les Alpilles. En ce moment, on voit le Mont Ventoux enneigé et le Luberon. Gîte bien équipé et confortable, idéal pour une famille avec 2 enfants. Jardin très bien entretenu et agréable. Propriétaire très accueillante et sympathique. Die Ferienwohnung ist sehr schön gelegen, ein wenig abseits vom Touristentrubel, aber mit dem Auto nur 5 Minuten vom Stadtzentrum Saint-Rémys entfernt, in idealer Lage für sehr lohnenswerte Ausflüge in alle Himmelsrichtungen(Alpilles, Luberon, Avignon, Arles, Camargue, das Meer...). In der Wohnung selbst ist alles für einen erfreulichen Urlaubsaufenrhalt Notwendige vorhanden, das Bett hätte - für unsere Bedürfnisse - ein wenig breiter und weicher sein dürfen. Der Gesamteindruck ist nichts desto trotz wirklich sehr gut, das Preis-Leistungsverhältnis stimmt auf jeden Fall. Wir bedanken uns herzlich bei der sehr freundlichen und hilfsbereiten Madame Tramier, grüßen die Hunde, Esel und Pferde und empfehlen dieses Domizil sehr gerne weiter. Je remercie Monika et Mike d'avoir pris de leur temps pour rédiger une appréciation après leurs vacances dans mon gîte. Cela me fait plaisir quand mes hôtes sont contents de leur séjour. Je pense que mes hôtes se sont bien reposés et ont profité du calme dans le jardin. Peut-être une prochaine fois, on pourra se revoir. The cottage is located in the heart of the Provence, in the middle of the Natural Park of Les Alpilles. Very near, you will be able to visit towns like Arles, Avignon, Aigues-Mortes, Aix-en-Provence and especially Baux-de-Provence and at the same time live a complete change of scenery whether you are in Camargue or at the top of the Mont-Ventoux. You will be able to walk or mountain bike in the Massif of Les Alpilles. It is a true delight, especially during spring, when all the vegetation comes back to life again. In autumn, the days are very nice and from October, the “olivades” take place (olives picking. You will be able to visit the active oil mills. And it is Christmas, with all its Provencal traditions (markets, midnight mass with the shepherds, the Provencal people and the offering with the lamb and the “floucas” (ram leading the herd). Golf: Very near Saint-Remy are 2 golf courses. One in Baux-de-Provence and the other one in Avignon.